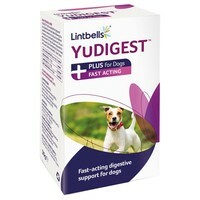 Lintbells YuDIGEST PLUS for Dogs is a unique complex of prebiotics and probiotic bacteria to actively support the digestive system of dogs with more serious digestive upsets. Montmorillonite - A special kind of clay that binds viruses and toxins so they safely pass through your dog's diegestive system. Threonine - An essential amino acid that helps the cells in the intestine to produce the protective gut lining which is often lost in digestive upsets. Linseed Meal - Provides a natural source of fibre rich in lignans and antioxidants to support digestive functions. Sprinkle the following amounts daily over your dog's food for as long as considered necessary or advised by your veterinary surgeon. Daily Dose How many days will a tub last? The powder can also be mixed with 10-15ml of warm tap water to form a paste which can be fed directly into the dog's mouth.